For more than 60 years, the Kleinfeld Bridal Boutique has been making dreams come true for brides to be. Brides have learned that the magic of Kleinfeld lies not just in magnificent stores, not just in offering the largest and finest selection of designer wedding gowns in the world, but in the hearts of the most professional staff anywhere…a staff dedicated to delivering their every wish. In 2014, Hudson’s Bay opened a Kleinfeld salon on the 7th floor of its flagship store on Queen Street in Toronto, Ontario, Canada. With 20,000 square feet of white-washed floors and vaulted ceilings, this one-stop-shop for brides has over 700 bridal gowns, as well as bridesmaids’ and flower girl dresses, shoes, jewelry, lingerie and headpieces. 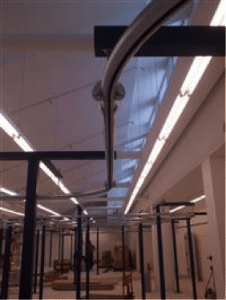 During the renovation and re-construction of the space that would become Kleinfeld Hudson’s Bay, Pacline Overhead Conveyors was contacted to provide a garment handling solution for storing and handling the large inventory of wedding gowns and other bridal apparel. The goal for Kleinfeld was to have an automated storage and retrieval system that would maximize the space utilization of the back storage room area of the Bridal Salon. By far the bulk of the 20,000 square foot space was dedicated to the customer area with its spectacular showroom and displays and the numerous oversized fitting rooms. There were only three stock rooms, with a handling area totalling roughly 2,800 square feet. The new garment handling system also needed to have an initial capacity of 600 dresses with the capability of increasing capacity by approximately 35% in the future. Unlike traditional installation jobs in commercial or industrial settings, this installation was on the 7th floor and in a retail space. All freight had to be transported by elevator from the loading dock to the 7th floor. The space for maneuvering the floor stands and crates containing an assortment of conveyor components and hardware, was extremely restricted to say the least! The second unique situation was the flooring in the area where the conveyor was to be installed. In this old building the floor was a combination of wood and concrete. This required some special considerations in order to properly secure the vertical floor stands. The PAC-LINE™ enclosed track overhead conveyor has proven to be the ideal solution for the garment handling system at Kleinfeld. The final design included two independent conveyor loops each with their own RETRIEVER™ control system. All components of the PAC-LINE™ are modular and easily bolted together. This means that minimal welding is required. This feature facilitated a very quick installation. 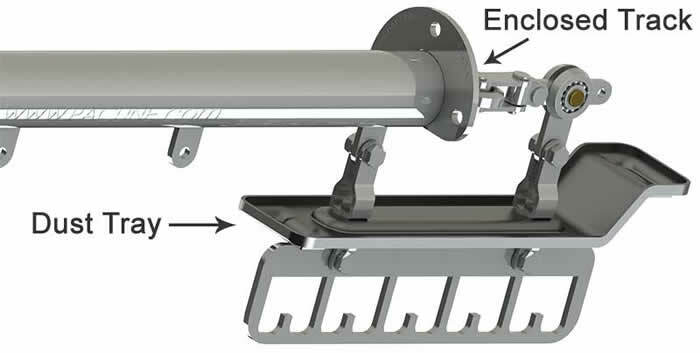 In addition, as modifications or expansions are required in the future these too would be quicker and simpler to implement than most alternative conveyors. Dust shields – These were added to protect the delicate and expensive garments from any possible contaminants. Quiet operation – the enclosed track operates with minimal noise while the conveyor is running. 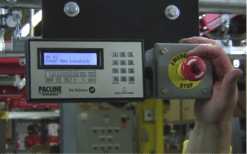 The Pacline RETRIEVER™ control system was an important part of this garment system. This simple and inexpensive control station arrangement allows the operator to locate ANY item on the conveyor and retrieve it quickly and efficiently on demand. The operator simply enters the location number of the dress, and the conveyor takes the shortest route to deliver it to the operator. The RETRIEVER™ also allows the conveyor to stop and wait for the removal of the dress before proceeding to the next ‘pick’. The PAC-LINE™ conveyor with Retriever™ controls provided a Garment Storage and Retrieval solution that allowed the customer to conserve valuable space in their facility, while providing the capacity for additional growth. Since all PACLINE parts and components were stocked, delivery was quick. PACLINE’s professional installers ensured that the entire system was up and running well within the expected deadlines. PACLINE continued to add value by training boutique staff on how to use the conveyor and Retriever™ and by reviewing standard operating procedures and basic conveyor maintenance with the maintenance staff. For more information about PACLINE garment handling systems visit our website or contact a PACLINE engineer at 1-800-955-8860.